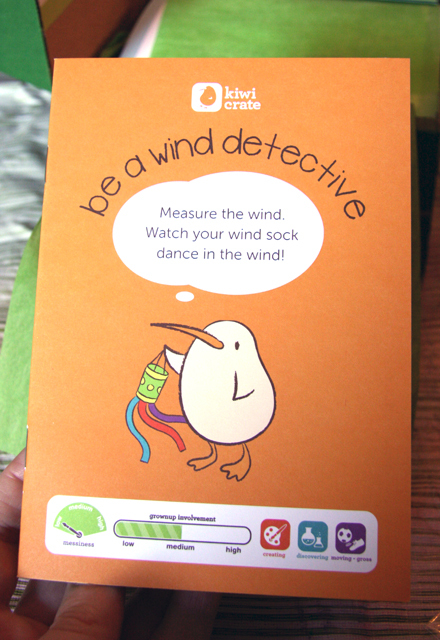 Look what those lovely people over at Kiwi Crate sent our way so we could try it out and share our findings. It's a sample of a subscription box service that includes all the materials you need to complete themed projects ... with the kids! Isn't it adorable? Look what's inside. 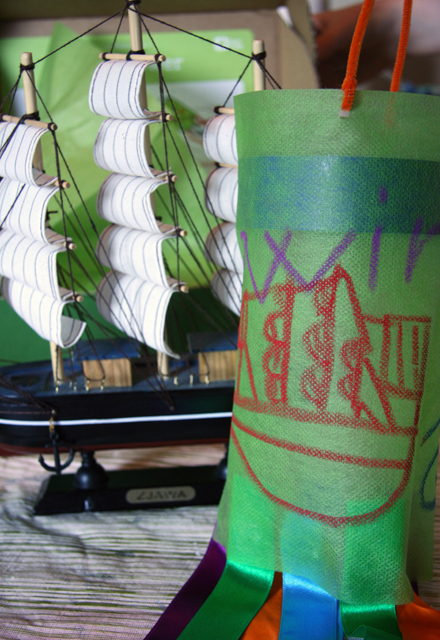 ... everything we needed to make our own wind sock and document our wind findings. First I want to say 'thank you' for the wicked pair of kid-sized scissors! Also the pastels and the beautiful shiny ribbon. 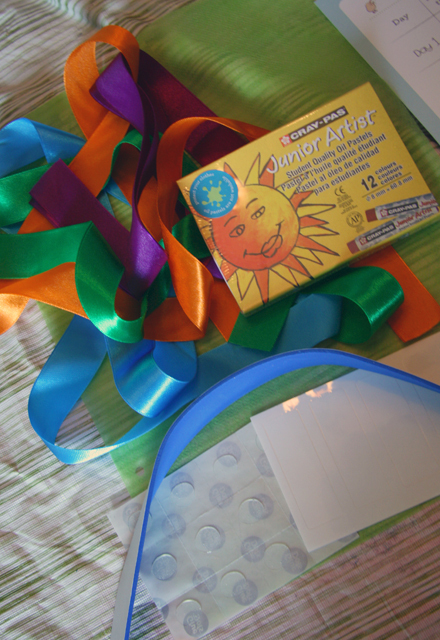 I also loved that the glue dots and sticker-tape strips were just the amount we needed. No excess. So tidy. It also came with a little booklet that gives the how-to and also some thought starters / tips on how to take the activities further. 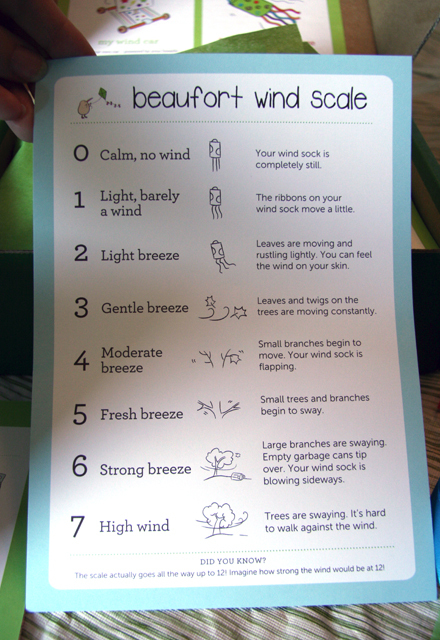 On the other side of this is a chart where our little wind scientist is keeping a daily record of the wind on our deck. Ah, there it is, breezing about. Spud declared out loud "I'm proud of this!". Well, that's an endorsement if I've ever heard one. And you know what's really great? We still have a whole other project to tackle next weekend. 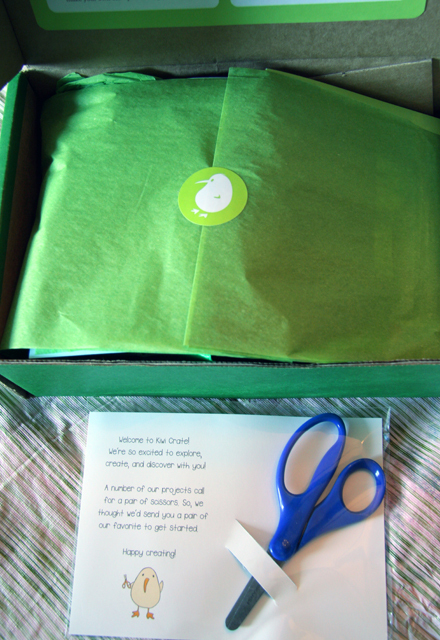 So, for $20 / month you get a Kiwi Crate delivered to your door (update: ships in Canada now too) filled with opportunities to use your hands and imagination together with your little people. I think this would make a fantastic gift ... you know ... the kind that "keeps on giving". Especially for super busy or not-so-crafty-type parents. I can also see this being a very handy thing to bring on the next road trip, a visit to Grandma's, or even camping ... since it literally has everything you need contained in the box, it makes packing up activities that much easier. Need to find activities. Thanks for the review!